"My players showed me a fantastic performance tonight," Oh said. "I know we are doing it for Japan. "They've been supporting us so much, that's why we were able to accomplish this, so we'd like to share this great moment with all those fans back home in Japan and also here." Oh is not unaccustomed to the spotlight, even when it reaches an international level. The 65-year-old manager is a legend, owning the distinction of being the most prolific home run hitter in professional baseball history. Prior to the start of the game, Oh walked arm-in-arm with fellow 500 Home Run Club®member and hitting legend, Major League Baseball record holder Henry Aaron. At the third-base line, Oh stopped, presented Aaron with a ball, and Aaron walked to the mound to throw out the ceremonial first pitch. Aaron and Oh's names have been linked for nearly 30 years, ever since Oh passed Aaron with his 756th homer on Sept. 3, 1977, to set the mark for the most homers in all of professional baseball. Oh ended his 22-year career with the Yomiuri Giants in 1980, with 868 home runs. With legends Sadaharu Oh managing the team and Ichiro Suzuki in right field, the Japanese finished 5-3 in the tournament, defeating archrivals Korea and Cuba during the past three days. During both games, Ichiro was dropped to third in the lineup, and he finished the tournament hitting .364 (12-for-33) with hits in each of Japan's eight games. Asked if he had turned it up a notch in San Diego, Ichiro said: "It was probably not a good thing for me to think, but I didn't care if I got injured. That's how much I wanted to win the championship." For the Japanese, there was a moment of instant elation, and then a moment of recognition that the run of this particular team was already over. But that moment will last long in the heart of every Japanese baseball fan, said Oh, who may have topped his all-world leading 868 homers as a player with this single win as a manager. "The fans have been supporting us so much," Oh said. "That's why we were able to accomplish this. So we'd like to share this great moment with all them back home, and those who were here." Winning is also nothing new to Oh. 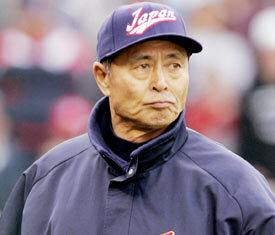 As a player, he led the Giants to nine straight Japan series titles from 1965-73. 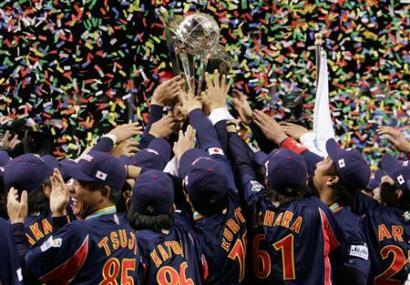 As a manager, he won Nippon Professional Baseball championships in 1999 and 2003 with the Fukuoka Daiei Hawks, whom he's skippered since 1995. 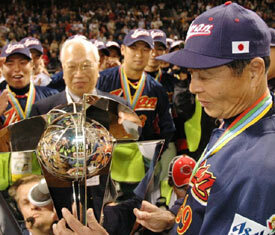 But winning the inaugural World Baseball Classic ranks up near or at the top of his accomplishments. Although the players decided this tournament, it was only fitting that Oh was in the middle of all of the postgame jubilation -- as were the spikes he wore in this championship game. They're headed to the Baseball Hall of Fame and Museum, joining a jersey from Oh's playing days that already lives in the hallowed Hall.